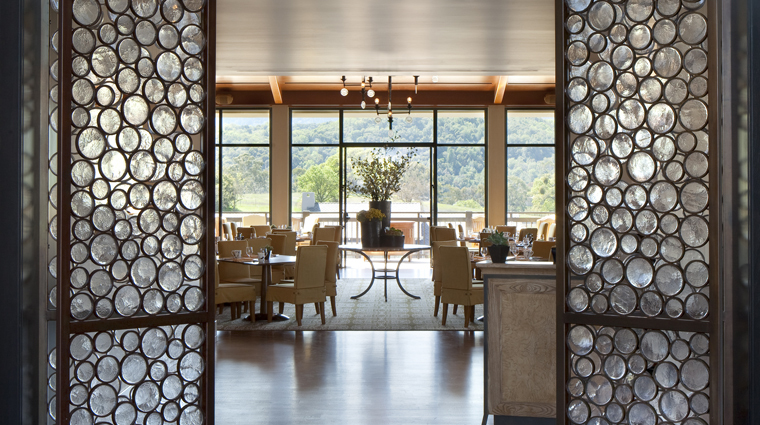 With its massive, floor-to-ceiling windows, intriguing open kitchen and cozy fireplaces, Forbes Four Star Madera, the restaurant inside the Rosewood Sand Hill resort, is a beguiling place to take a table and dig into locally sourced, seasonal California cuisine. To put it simply: it’s spectacular. Chef Peter Rudolph grew up in the Bay Area and has a passion for the flavors and rich resources found in this region. At dinner, dishes might include pan-roasted squab with braised pine nuts, carrots and kumquat confit, or dayboat scallops with roasted chanterelle mushrooms, rapini and apple turnip purée. Sommelier Paul Mekis holds an advanced sommelier designation, and he puts his vast knowledge to good use in selecting a well-rounded wine list that spotlights star bottles from the region. • The open kitchen is bustling with chefs and fun to watch. 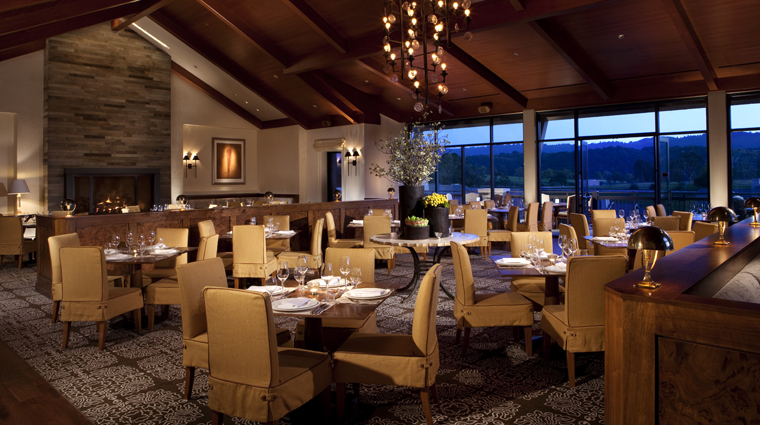 • The elegant yet cozy atmosphere at Madera pays homage to the Silicon Valley’s rich history and local cuisine. 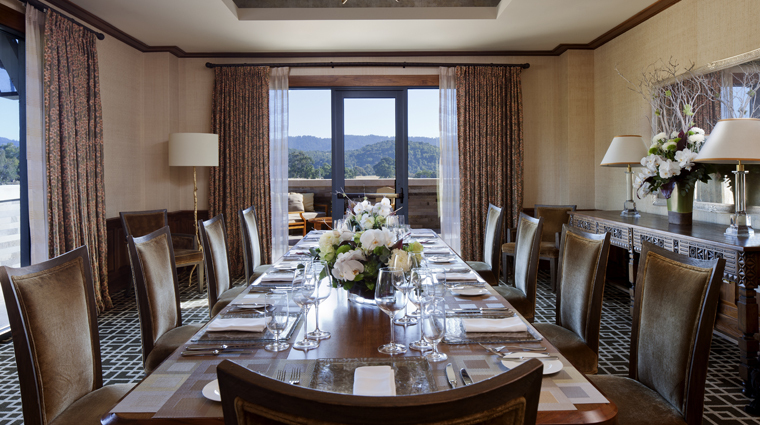 Whether you’re seated indoors by the cozy fireplace or on the terrace with picture-perfect views, Madera offers local California cuisine with a view. • A team of sommeliers oversees a massive wine list with more than 2,000 labels. The vino specialists are huge fans of Coravin, a handy gadget that allows collectors to sip wine by the glass without pulling out the cork. The sommeliers maintain a special bottle list devoted to older, rare vintages that can be enjoyed thanks to the technology. • The Rosewood Sand Hill, a hotel located on 16 acres in the Bay Area of California, is about 35 miles south of San Francisco. 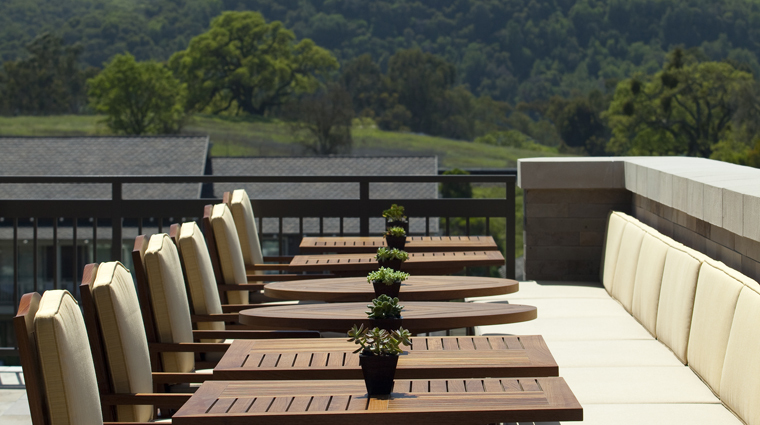 The restaurant is in an idyllic location, with the Santa Cruz Mountains beckoning in the distance. • The dress code at Madera is business casual, but shorts and sandals are acceptable. However, even if you can get away with a loose dress code here, you might want to step up your fashion — Madera is a fine dining restaurant, after all. • Taken from the Spanish name for wood, Madera specializes in American cuisine that’s primarily prepared using a wood-fire grill, imagined by executive chef Rudolph. • Chef Rudolph’s multi-course tasting menu is a revelation. Think delicate, melt-in-your-mouth hamachi crudo with leeks and lime; sensational seared foie gras with quince and puffed pastry; and succulent red snapper with roasted cabbage, buttermilk brandade and caviar. • Although it’s incredibly upscale, Madera is still a hotel restaurant and so it’s open for breakfast and lunch. In the morning guests can indulge on a California omelet with ham, roasted peppers and avocado or chia seed pudding, coconut milk and flax seed. Lunch options are luxurious and include salmon tartare, roasted trout, and bouillabaisse. • The dinner menu changes often — the food is dictated by the seasons, so if you look at the offerings online before you arrive at the resort, note that the dishes you were eyeing might not be available. • The large room has one wall of windows that overlook the pretty green grounds and pool. • An oversized fire place ensures that diners aren’t cold on chilly evenings. • The lighting is low, but the warm color palette and lively atmosphere, make the restaurant feel exceptionally festive.